The jellyfish class with the smallest number of species is the Cubozoa, or box jellyfish. So named because of their box-like bells, cubozoans occur in shallow tropical seas and coastal mangrove waters, from Florida to the Indo-Pacific. The best known, especially to Australian bathers, is the sea wasp, Chironex fleckeri. Unlike most jellyfish, Chironex is a fast and agile swimmer, moving at up to 3 knots, and has the distinction of being the most venomous creature in the sea. Originally ranked as an order, cubozoans were elevated to class status after research revealed the magnitude of the differences separating them from other cnidarian groups. They have a different life cycle, a distinctive shape, a flap around the inside rim of the bell (as with hydrozoans) to aid propulsion, tentacles only at the rim corners, and four rhopalia, one on each side, as against eight or more in scyphozoan jellyfish. The rhopalia are pendent club-shaped sensory complexes, sensitive to light, odour, and orientation; they are also fitted with pacemakers that control the expansion and contraction of the bell and hence the speed and direction of locomotion. In most jellyfish the light sensors are rudimentary, but in cubozoans they consist of two simple pigmented pits, two slit eyes, and two vertically aligned, spherical camera eyes, the smaller one pointing up, the larger one down. Three types of sensor, twenty-four eyes in total. As with human beings, the camera eyes include a cornea, a retina, a crystalline lens, and an iris. The larger one also includes a pupil, regulating the amount of light hitting the retina according to the light’s intensity. Gradients in the density of the lens produce a gradient in the refractive index, enabling the lens to focus light to one focal depth. In the upper eye the refractive index decreases smoothly towards the periphery; in the lower one the gradient surrounds a nearly homogeneous core. For such a minute eye it is surprising to find well-corrected, aberration-free imaging, otherwise known only from the much larger eyes of vertebrates and cephalopods. The gradient in the upper-eye lenses comes very close to the ideal solution. The lenses of the lower eye have a less ideal gradient and consequently display some spherical aberration. Dan Nilsson et al, Nature 435:202 (2005). The sharp image falls well below the retina and it would seem that the sharp focus of the lenses is wasted by inappropriate eye geometry. Another, more likely, interpretation is that the eyes are ‘purposely’ under-focused. Most jellyfish operate in the open sea and do not need complex eyes. Obtaining their prey passively, they need to distinguish only between day and night, so that they know when to rise to the surface and feed on the plankton that congregate there nocturnally. So their photo- sensitive cells fall short of being complete light-detecting organs. Box jellyfish, by contrast, sleep at night. During the day they operate in shallow, near-shore environments, where there are obstacles such as rocks and tree roots. Eyes, for them, are a specialism rather than an essential part of the body plan, and each type of eye is specialised for a particular function. Under-focusing helps them detect the large, stationary structures of their environment while ignoring the plankton and small particles that drift with the current. Having no brain, the jellyfish filters information about object size, motion, and ambient light through the optics of the eyes themselves. The filtered information then passes to the nervous system and interconnected pacemakers, and the animal responds to what it sees by adjusting the speed and direction of its travel. A brain is not necessary. Why should evolution have produced highly sophisticated optics that have only poor resolution? Isn’t higher resolution always better, irrespective of the visual function to be fulfilled? To which his answer is, ‘Obviously not.’ Instead, we should think of other examples where the degradation of spatial resolution in the visual system is a ‘design feature’, as with insect eyes. The analogy with insects confirms that looking for some functional explanation for the apparent imperfection is not futile. Darwin famously wrote in On the Origin of Species that the eye is so complex that its evolution by natural selection seems ‘absurd’. The key to the puzzle, he argued, was to find eyes of intermediate complexity in the animal kingdom that would demonstrate a possible path from simple to complicated. Now, a detailed study of the eyes of the box jellyfish (Tripedalia cystophora) has thrown up one of these fascinating intermediate stages. If one thing is obvious, it is that the jellyfish eye cannot be interpreted as an intermediate stage. Jellyfish first appear in the Cambrian (possibly earlier) and have continued to the present day. We do not see them evolving into something higher than jellyfish, nor emerging from a state that was lower. The existence of camera eyes in the jellyfish does nothing to clarify the origin of eyes, be it in trilobites (which also existed in the Cambrian, along with numerous other seeing creatures), in the various orders of insect or in ourselves. Cambrian cephalopods already had camera eyes, and they were to ‘evolve’ independently several times again in animals as diverse as jumping spiders and annelid worms. Not only is it clear that part of an eye is better than no eye at all. We also can find a plausible series of intermediates among modern animals. This doesn’t mean of course, that these modern intermediates really represent ancestral types. But it does show that intermediate designs are capable of working. Some single-celled animals have a light-sensitive spot with a little pigment screen behind it. Among many-celled animals, various types of worm and some shellfish have a similar arrangement, but the pigment-backed light-sensitive cells are set in a little cup. This gives slightly better direction-finding capability, since each cell is selectively shielded from light rays coming into the cup from its own side. In a continuous series from flat sheet of light-sensitive cells, through shallow cup to deep cup, each step in the series, however small (or large) the step, would be an optical improvement. Now, if you make a cup very deep and turn the sides over, you eventually make a lensless pinhole camera. When you have a cup for an eye, almost any vaguely convex, vaguely transparent or even translucent material over its opening wall will constitute an improvement, because of its slight lens-like properties. Anti-evolution propaganda is full of alleged examples of complex systems that ‘could not possibly’ have passed through a gradual series of intermediates. This is often just another case of the rather pathetic ‘Argument from Personal Incredulity’. Dawkins counters the common-sense perception that the evolution of a complex organ such as the eye is absurd by inviting us to imagine that it might have been constructed through a series of tiny increments. As in a children’s game, we then arrange the visual systems of living animals in a row and imagine that it represents such a series. Creationists have too little faith, too little credulity. What is required to make the theory of evolution plausible is an exercise in make-believe. Arguments of this kind are remote from science in the accepted sense. The theory of evolution requires a series of such steps from within the same lineage, not picked from different, concurrent lineages so as to promote the illusion of a single evolutionary tree. 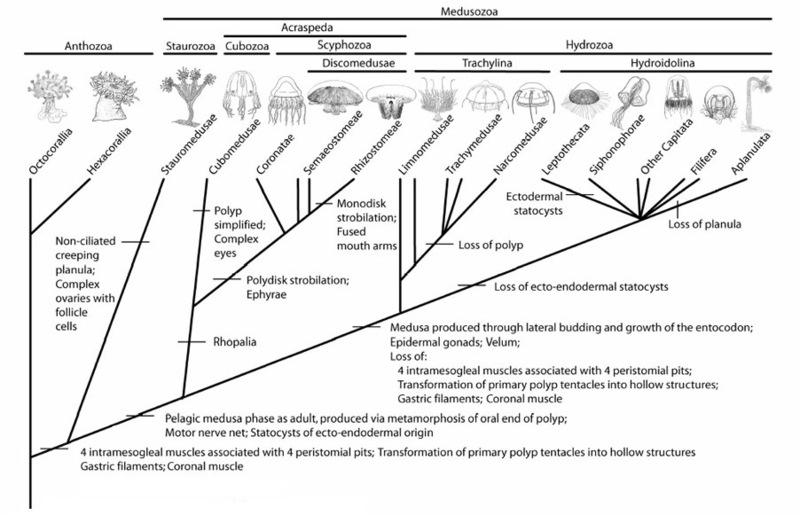 It should be possible, for example, to point to various stages of eye evolution across the 30 or so species of box jellyfish. Given that scyphozoans represent the primitive condition, we should be able to see across the scyphozoans and cubozoans together – some 200 species – a comprehensive range of eye forms, from very simple to the most complex. The evolution of the eye could have stopped at any stage of a species’ history. But this is not what we find. All scyphozoans have simple eyes; all cubozoans have camera eyes, and only cubozoans have them. The evidence indicates that at whatever time cubozoans acquired their complex visual systems, they acquired them suddenly, not by a series of transitional stages, by nature mutationally improvising as it went along. They acquired them by the same means as any developing individual acquires its organs, through their genetic program. Like development, evolution is pre-programmed in the genes. Belief in a miracle-working pseudo-deity is not required. A semi-technical discussion of the kind of evolution we observe in nature today and to what extent it is evidence for evolution in the past. The testimony of a man who was killed by a box jellyfish, saw God, and came back to life.